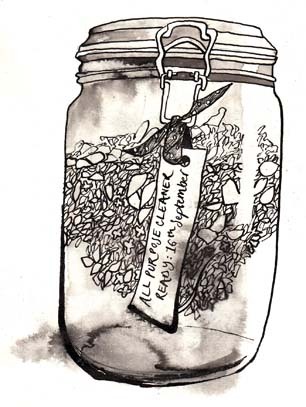 Last summer I had a grand plan to make my own homemade cleaning products. I’d read a few books and some articles on the internet. People waxed lyrical about how much better it is for the environment, your health, and for your pocket. I became positively evangelical about how wonderful it was going to be. I researched the best recipes and got started. Most recipes were based on white vinegar and, although distilled white vinegar is inexpensive at the supermarket, we thought we’d go one better and make our own. Big Dreamer got brewing and concocted a huge vat of homemade vinegar that will be maturing in the next month or so. In the mean time I decided to follow some of the advice I’d read, to steep the cleaning products with herbs and flowers from the garden. In the picture above I’d used thyme and rose petals. Now, eight months later I feel I can deliver my verdict…with one exception it really didn’t work. The biggest disappointment was the washing-up liquid. The recipe for that required vinegar, tea tree oil, and pure soap, which I steeped with lemons. Many of the recipes for this directed me to dissolve the soap in the liquid mixture on the hob, but I just couldn’t get it to stay dissolved. As soon as the solution cooled down the soap flakes appeared again, sitting on the surface. We persevered and used it anyway but it didn’t actually clean the dishes and left a weird scum everywhere, so that one was abandoned. I have since read that trying to combine vinegar and pure soap is the root of the problem so I may well give that one another go with a non-vinegar recipe. Here’s a potential if you’re interested. Adding vinegar to my wash cycle as a fabric softener didn’t really work either. It didn’t have much impact on the towels (which is basically all I use it for) other than to make them smell a bit vinegary. By the time I’d added as much as was recommended I may as well have bought standard fabric softener. I also made an all-purpose cleaner and a disinfectant. The main problem with these was my enthusiastic ‘steeping’ of garden produce to scent the solutions. It looked fine when I was actually doing the cleaning but the next day I noticed brown drip marks where I’d cleaned. I think the plant residue in the cleaning products was what was causing the problem. We’ve now abandoned Big Dreamer’s vinegar vat as a raw material for the same reason. I should also say that cleaning was hardly a breeze with these solutions. A small child and an athletic husband mean our bath often needs a good scrub and using these hand-made products made it really hard work. Life is just too short to spend a couple of hours a week cleaning the bath! The exception is the disinfectant, which I think I will make again with a few modifications. Firstly I won’t steep it in anything but will just buy a nice essential oil to scent it instead, so hopefully no brown residue. Secondly, I probably won’t use it for any ‘serious’ cleaning. I think it works best as a general surface cleaner and it’ll be particularly handy for using on the baby’s things, such as the high chair or change mat. Other uses for vinegar I tried out were as a weed killer and as a de-icer. The de-icer worked really well. Thumbs up for that one. The weed-killer did work but not on any really determined weeds. You have to coat the leaves in the vinegar so that they go all brown and dry up. The plant puts up more leaves so you have to keep coating the new leaves until the root finally gives up the ghost. Living on a farm means determined weeds, such as docks and thistles. They just laughed at the vinegar. Have any of you tried making your own cleaning products? What were your experiences? Oh, and suggestions for what to do with 19 litres of homemade vinegar are most welcome! This entry was posted in Countryside, Making changes and tagged all-purpose cleaner, cheap, de-icer, disinfectant, environmentally friendly, fabric softener, healthy, homemade, homemade cleaning products, homemade vinegar, illustration, lemons, pure soap, rose petals, soap flakes, steeping, tea tree oil, thyme, washing-up liquid, weed killer, weeds, white vinegar. Bookmark the permalink. Sell your vinegar to the nearest fish and chip shop?? ?